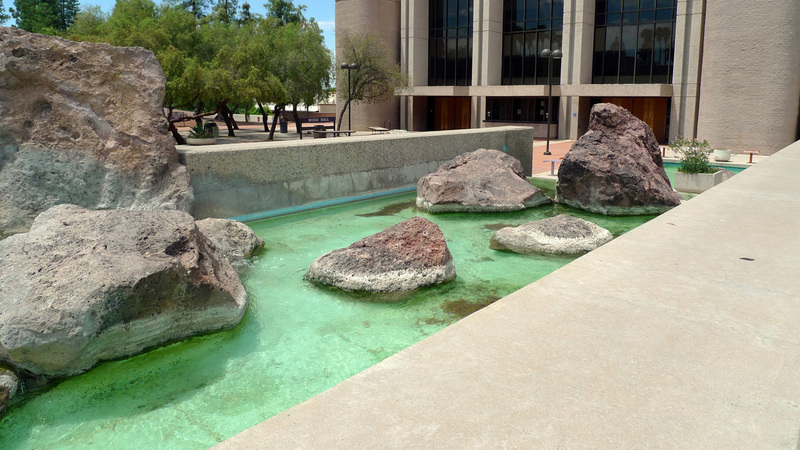 “Landscaping Accentuates ‘People Place’” was the headline in the local newspaper upon the grand opening of the Tucson Community Center in 1971. This landscape – composed of stepped terraces, undulating water courses, tree groves, and cool shallow pools – was created by Garrett Eckbo. Today, it faces destruction nearly 40 years after its completion by the very city that once commissioned it. In the late 1960s and early 1970s downtown Tucson experienced a major transformation as part of the trend of urban renewal prevalent at that time. During that era, entire blocks of the historic downtown and many of its minority neighborhoods were destroyed in order to build large civic complexes and buildings. The Tucson Community Center (now called the Tucson Convention Center) was one such project. It included a grand opera hall, a smaller performance-based theater, and a main conference area with private show rooms, exposition halls, and an arena. Garrett Eckbo of Eckbo, Dean, Austin and Williams (later known as EDAW) was hired to develop a landscape that would tie the three buildings together with a central plaza. It is the second of three landscapes in the area designed by Eckbo that also included Viente de Agosto Park (1971), which eventually became a linked chain of public spaces. The layout of the site consists of both formal and informal elements. It includes upper and lower grid-based tree groves which are linked by a series of stepped concrete terraces. Carved into the terraces are a variety of shallow pools with hand-selected boulders used to articulate their perimeters. The pools and terraces create a series of waterfalls, some of which flow smooth and sheet-like, while others surge like grand, river rapids. It is easy to see that Eckbo was inspired by the contrast of the surrounding Sonoran Desert with its pine tree covered Catalina mountains to the north. His design of boulders and waterfalls cascading down the “urban canyon” was likely inspired by the nearby natural setting of Sabino Canyon. It is probable that his design intended to bring the mountains down into the city center in order to offer city dwellers an “urban swimming hole” as there are clear steps that lead down into the water. The designers [EDAW] point out that the Community Center was intended to be a people place, and that activities and interests change as people become interested in new ideas. They designed the outdoor space to accommodate new expressions of ideas. His design of the plaza invites passers-by to participate in it. The various terraces provide a perfect setting for outdoor performance and informal gathering. (top) Upper fountains, just after completion. (bottom) Aerial of eastern section of the newly finished Community Center. Images courtesy the Arizona Historical Society. Many changes to the original design have occurred over the years and at some point, the natural tones of the fountains (as specified by Eckbo) were replaced with a coat of turquoise paint. More recently, brightly colored metal chairs were bolted into the concrete in various locations in an effort to attract the attention of absent minded passers-by to the “hazardous” fountain edges. As the work of a master, Ekbo’s design is potentially eligible for the National Register of Historic Places.The imminent threat to the design is the essential commitment to annual maintenance. However for the city of Tucson, which, like many cities, is suffering from the current economic downturn this is not a top priority. Today, a number of pools are in disrepair. Maintenance crews report that leaf debris and outdated technology make it hard to keep the waterworks functioning. The City has commissioned a local firm to come up with a complete redesign of the area. Last year, the City sought to fill in the fountains with sand as a temporary measure to mitigate liability. Although local supporters managed to convince the City to hold off making a decision about Eckbo’s landscape, the threat of its destruction remains.Meanwhile, the biggest misfortune of all has been the missed opportunity to embrace Eckbo’s meticulously designed plazas and fountains by creating appropriate programming to engage the greater community.